Population Ranked 28th in the U.S.
Oklahoma is a state located in the South Central region of the United States of America. With 3,579,212 residents in 2006, it was the 28th most populous and 20th-largest state by land area. It is known informally by its nickname, The Sooner State. Formed from Indian Territory on November 16, 1907, it was the 46th state to enter the union. Its people are known as Oklahomans, and its capital and largest city is Oklahoma City. With small mountain ranges, prairie, and eastern forests, most of Oklahoma lies in the Great Plains and the U.S. Interior Highlands. Oklahoma was the destination of the Native American Cherokee tribes who, in 1838, were forced to trek westward from their homelands on the east coast. In the Cherokee language, the event is called Nunna daul Isunyi – "the Trail Where We Cried." This event has become known as the Trail of Tears. In 1902 there was an effort to make Oklahoma an all Indian state to be named Sequoyah. However, following the Civil War, the territory was settled by non-Natives and by the time Oklahoma achieved statehood, the Native population was outnumbered, making the case for a Native American state moot. While they never got their own state, the constitution from the Sequoyah convention became the basis for the new state of Oklahoma's constitution in 1907. Today there are 39 tribes and nations of American Indians headquartered in the state, while descendants of the original 67 tribes inhabiting Indian Territory still reside there. A major producer of natural gas, oil and food, the state relies on an economic base of aviation, energy, telecommunications, and biotechnology. It had one of the fastest growing economies in the nation in 2007, leading states in gross domestic product growth and ranking third in per capita income growth. Part of the Bible Belt, widespread beliefs in evangelical Christianity make Oklahoma one of the most conservative states, though voter registration in the Democratic Party tends to exceed that of the Republican Party. 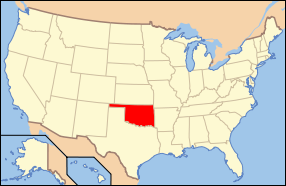 Oklahoma is the 20th-largest state in the United States, covering an area of 69,898 square miles (181,196 km²), with 68,667 square miles (110,508.8 km²) of land and 1,231 square miles (1,981.1 km²) of water. It is one of six states on the Frontier Strip, and lies partly in the Great Plains near the geographical center of the 48 contiguous states. It is bounded on the east by Arkansas and Missouri, on the north by Kansas, on the northwest by Colorado, on the far west by New Mexico, and on the south and near-west by Texas. A river carves a canyon in the Wichita Mountains. The state has four primary mountain ranges: the Ouachita Mountains, the Arbuckle Mountains, the Wichita Mountains, and the Ozark Mountains. The U.S. Interior Highlands Region, which contains the Ozark and Ouachita Mountains, is the only major mountainous region between the Rocky Mountains and the Appalachians. A portion of the Flint Hills stretches into north-central Oklahoma, and in the state's southeastern corner, Cavanal Hill is officially regarded as the world's tallest hill; at 1,999 feet (609 m), failing the definition of a mountain by one foot More than 500 named creeks and rivers make up Oklahoma's waterways, and with 200 lakes created by dams, it holds the highest number of artificial reservoirs in the nation. . Among the most ecologically diverse states, Oklahoma is one of four to harbor more than 10 distinct ecological regions, containing eleven within its borders, more per square mile than in any other state. Marked by differences in geographical diversity between its western and eastern halves, eastern Oklahoma touches eight ecological regions, while its western half holds three. Most of the state lies in two primary drainage basins belonging to the Red and Arkansas rivers, though the Lee and Little rivers also contain significant drainage basins. In the state’s northwestern corner, semi-arid high plains harbor few natural forests and rolling to flat landscape with intermittent canyons and mesa ranges such as the Glass Mountains. Partial plains interrupted by small mountain ranges like the Antelope Hills and the Wichita Mountains dot southwestern Oklahoma, and transitional prairie and woodlands cover the central portion of the state. The Ozark and Ouachita Mountains rise from west to east over the state's eastern third, gradually increasing in elevation in an eastward direction. Oklahoma is home to large populations of white-tailed deer, coyotes, bobcats, elk, and migrating birds such as quail, doves, cardinals, bald eagles, red-tailed hawks, and pheasants. In prairie ecosystems, American bison, greater prairie-chickens, badgers, and armadillo are common, and some of the nation's largest prairie dog towns inhabit shortgrass prairie in the state's panhandle. In the Ouachita Mountains, the state's most biologically diverse ecosystem, black bear, red fox, grey fox, and river otter populations coexist with nearly 330 other vertebrate species. Oklahoma has 50 state parks, six national parks or protected regions, two national protected forests or grasslands, and a network of wildlife preserves and conservation areas. Over six percent of the state's 10 million acres (40,468 km²) of forest is public land, including the western portions of the Ouachita National Forest, the largest and oldest national forest in the southern United States. With 39,000 acres (158 km²), the Tallgrass Prairie Preserve in north-central Oklahoma is the largest protected area of tallgrass prairie in the world and is part of an ecosystem that encompasses only 10 percent of its former land area, once covering 14 states. In addition, the Black Kettle National Grassland covers 31,300 acres (127 km²) of prairie in southwestern Oklahoma. The Wichita Mountains Wildlife Refuge is the oldest and largest of nine national wildlife refuges in the state and was founded in 1901, encompassing 59,020 acres (238 km²). Of Oklahoma's federally protected park or recreational sites, the Chickasaw National Recreation Area is the largest, with 4,500 acres (18 km²). Other federal protected sites include the Santa Fe and Trail of Tears national historic trails, the Fort Smith and Washita Battlefield national historic sites, and the Oklahoma City National Memorial. 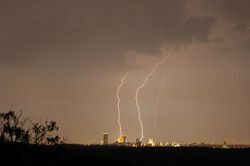 Oklahoma is located in a climate prime for thunderstorm development. Oklahoma is located in a temperate region and experiences occasional extremes of temperature and precipitation typical in a continental climate. Most of the state lies in an area known as Tornado Alley characterized by frequent interaction between cold and warm air masses producing severe weather. An average 54 tornadoes strike the state per year—one of the highest rates in the world. Because of its position between zones of differing prevailing temperature and winds, weather patterns within the state can vary widely between relatively short distances. A humid subtropical zone along the state's southeastern border is influenced heavily by southerly winds bringing moisture from the Gulf of Mexico, but transitions progressively to a semi-arid zone in the high plains of the panhandle rarely touched by southern moisture. Precipitation and temperatures fall from east to west accordingly, with areas near the Texas border averaging an annual temperature of 62°F (17°C) and an annual rainfall of 56 inches (142 cm), while areas of the panhandle average 58°F (14°C), with an annual rainfall under 17 inches (43 cm). All of the state frequently experiences temperatures above 100°F (38°C) or below 0°F (−18°C), and snowfall ranges from an average of less than 4 inches (10 cm) near the Texas border to just over 20 inches (51 cm) on the border of Colorado in the panhandle. The state is home to the National Storm Prediction Center of the National Weather Service located in the town of Norman. Spaniard Francisco Vásquez de Coronado traveled through the state in 1541, but French explorers claimed the area in the 1700s. It remained under French rule until 1803, when all the French territory west of the Mississippi River was purchased by the United States in the Louisiana Purchase. The largest areas were distributed to the Choctaws (6,953,048 acres), Chickasaw (4,707,903 acres) and Cherokees (4,420,068). Several tribes (such as the Cherokee, Creek, Seminole, Chickasaw and Choctaw) received money for their former lands, which in some cases was used to buy land in Oklahoma and to support the building of schools. In 1835 some leaders of the Cherokee tribe signed the Treaty of New Echota. This agreement ceded all rights to their traditional lands to the United States. In return the tribe was granted land in the Indian Territory. Although the majority of the Cherokees opposed this agreement they were forced to make the journey by General Winfield Scott and his soldiers. In October 1838 about 15,000 Cherokees embarked upon what became known as the Trail of Tears. Most of the Cherokee traveled the 800 mile journey on foot. As a result of serious mistakes made by the Federal agents who guided them to their new land, they suffered from hunger and the cold weather, with an estimated 4,000 people perishing on the journey. 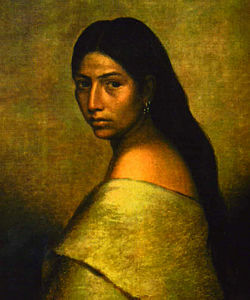 During the 1830s, thousands of Native Americans, including those comprising the "Five Civilized Tribes," were removed from their lands in Florida, Alabama, Georgia, and Tennessee and transported to Oklahoma 1830s. 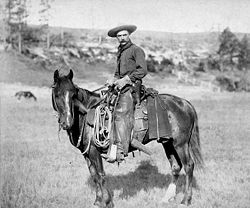 Cowboys drove cattle across the state in the late 19th century. When Indian Territory was opened to settlers, an estimated 3,000 African-Americans joined the 1889 rush to settle the Oklahoma Territory. Many southern newspapers of the 1880s urged blacks to move west to escape Jim Crow oppression, often specifically mentioning Oklahoma. A number of exclusively black towns sprang up in Oklahoma and the State’s population centers, such as Oklahoma City and Tulsa, also had considerable black populations. Delegations promoting statehood began near the turn of the 19th century, when the Curius Act abolished all tribal jurisdiction in Indian Territory. Failed attempts to create an all-Indian state named Oklahoma, and a later attempt to create an all-Indian state named Sequoyah failed, but the Sequoyah Statehood Convention of 1905 eventually laid the groundwork for the Oklahoma Statehood Convention, which took place two years later. On November 16, 1907, Oklahoma was established as the 46th state in the Union. The Dust Bowl ravaged parts of the state in the 1930s. The new state became a focal point for the emerging oil industry, as discoveries of oil pools prompted towns to grow rapidly in population and wealth. Tulsa eventually became known as the Oil Capital of the World for most of the twentieth century, and oil investments fueled much of the state's early economy. In 1927, Oklahoma businessman Cyrus Avery, known as the Father of Route 66. began a campaign to create Route 66. Using an existing highway which stretched from Amarillo, Texas to Tulsa, Oklahoma to form the original portion of Highway 66, Avery spearheaded the creation of the U.S. Highway 66 Association to oversee the planning of Route 66, based in his hometown of Tulsa. The Dust Bowl of the 1930s was a series of dust storms (sometimes referred to as black blizzards) causing major ecological and agricultural damage. Especially hard-hit were the states of Kansas, Texas, New Mexico, and Oklahoma. Little rainfall and abnormally high temperatures caused by severe drought conditions. Decades of extensive farming without crop rotation or other techniques that prevented erosion, the fertile soil of the Great Plains was exposed through removal of grass during plowing. During the drought, soil dried out, became dust, and blew away eastwards and southwards, mostly in large black clouds. At times, the clouds blackened the sky all the way to Chicago, and much of the soil was completely deposited into the Atlantic Ocean. This ecological catastrophe, which began as the economic effects of the Great Depression were intensifying, caused an exodus from Texas, Oklahoma, Kansas, and the surrounding Great Plains. Thousands slipped into poverty, with over 500,000 Americans left homeless. Some residents of the Plains, in especially Kansas and Oklahoma, fell prey to illnesses and death from dust pneumonia and the effects of malnutrition. Over a twenty-year period ending in 1950, the state saw its only decline in population, dropping 6.9 percent. In response, dramatic efforts in soil and water conservation led to massive flood control systems and dams, creating hundreds of reservoirs and man-made lakes. By the 1960s, more than 200 man-made lakes had been created, more than any other state in the nation. On April 19, 1995, Oklahoma City became the scene of one of the worst acts of terrorism ever committed in American history. Until the September 11, 2001 attacks on New York City's World Trade Center, it was the deadliest act of terrorism on U.S. soil. An oil derrick decorates the front lawn of the Oklahoma Capitol Building in Oklahoma City. 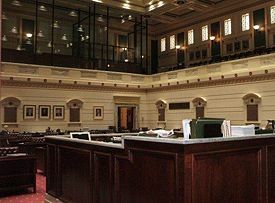 The Oklahoma Senate chamber houses the operations of the Oklahoma Senate. In 1889 some 10,000 homesteaders settled what is now downtown Oklahoma City, creating a tent city in a single day. Within 10 years the population had doubled in what became a permanent settlement and the future capital of Oklahoma. By the time Oklahoma was admitted to the Union in 1907, Oklahoma City had already supplanted Guthrie, the territorial capital, as the population center and commercial hub of the new state. Soon after, the capital was moved from Guthrie to Oklahoma City. The new city continued to grow at a steady rate until December 4, 1928, when oil was discovered in the city. Oil wells popped up everywhere and the sudden influx of oil money within the city and throughout the state greatly accelerated the city's growth. The government of Oklahoma is a liberal democracy modeled after the Federal Government of the United States, with executive, legislative, and judicial branches. The state has 77 counties with jurisdiction over most local government functions within each respective domain, five congressional districts, and a voting base with a majority in the Democratic Party. State officials are elected by plurality voting. The Legislature of Oklahoma consists of the Senate and the House of Representatives. The Senate has 48 members serving four-year terms, while the House has 101 members with two year terms. The state has a term limit for its legislature that restricts any one person to a total of twelve cumulative years service between both legislative branches. The executive branch consists of the Governor, his staff, and other elected officials. The principle head of government, the Governor is the chief executive of the Oklahoma executive branch, serving as the ex officio Commander-in-Chief of the Oklahoma National Guard when not called into Federal use and reserving the power to veto bills passed through the Legislature. The responsibilities of the Executive branch include submitting the budget, ensuring that state laws are enforced, and ensuring that peace within the state is maintained. Oklahoma has a voter demographic weighted towards the Democratic Party as of 2007. Though there are 11.6 percent more registered Democrats in Oklahoma than registered Republicans,  the state has voted for a Republican in every presidential election from 1968 forward, and in 2004, George W. Bush carried every county in the state and 65.6 percent of the statewide vote. Three third parties have substantial influence in state politics: Oklahoma Libertarian Party, Green Party of Oklahoma, and the Oklahoma Constitution Party. Following the 2000 census, the Oklahoma delegation to the U.S. House of Representatives was reduced from six to five representatives, each serving one congressional district. For the 110th Congress (2007–2009), there are no changes in party strength, and the delegation has four Republicans and one Democrat. 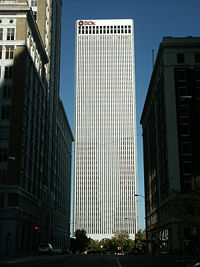 The BOK Tower of Tulsa, Oklahoma's tallest building, serves as the world headquarters for Williams Companies. Based in the sectors of aviation, energy, transportation equipment, food processing, electronics, and telecommunications, Oklahoma is an important producer of natural gas, aircraft, and food. The state ranks second in the nation for production of natural gas, and is the 27th-most agriculturally productive state, ranking 5th in production of wheat. Six Fortune 500 companies and one additional Fortune 1000 company are headquartered in Oklahoma, and it has been rated one of the most business-friendly states in the nation,  with the 7th-lowest tax burden in 2007. Though oil has historically dominated the state's economy, a collapse in the energy industry during the 1980s led to the loss of nearly 90,000 energy-related jobs between 1980 and 2000. Oil accounted for 17 percent of Oklahoma's economic impact in 2005, and employment in the state's oil industry was outpaced by five other sectors in 2007. Due to its position in the center of the United States, Oklahoma is among the top states for logistic centers, and a leader in weather-related research. The state's largest manufacturing industries are tire manufacturing, meat processing, oil and gas equipment manufacturing, and air conditioner manufacturing. It is the top manufacturer of tires in North America and contains one of the fastest-growing biotechnology industries in the nation. Oklahoma is the nation's second-largest producer of natural gas, fifth-largest producer of crude oil, has the second greatest number of active drilling rigs, and ranks fifth in crude oil reserves. As a whole, the oil energy industry contributes $23 billion to Oklahoma's gross domestic product, and employees of Oklahoma oil-related companies earn an average of twice the state's typical yearly income. In 2004, the state had 83,750 commercial oil wells and as many as 750,000 total wells, churning 178 thousand barrels of crude oil a day. Ten percent of the nation's natural gas supply is held in Oklahoma, with 1.662 trillion cubic feet. Three of the nation's largest private oil companies are located in Oklahoma, and all six of the state's Fortune 500 companies are oil-related. In 2006, Tulsa-based Semgroup ranked 5th on Fortune Magazine's list of largest private companies, Tulsa-based QuikTrip ranked 46th, and Oklahoma City-based Love's Travel Shops ranked 132nd. Tulsa's ONEOK and Williams Companies are the state's largest and second largest companies respectively, also ranking as the nation's second and third-largest companies in the field of energy. Oklahoma City's Devon Energy is the second-largest crude oil company in the nation. The 27th-most agriculturally productive state, Oklahoma is fifth in both cattle and wheat production. Approximately 5.5 percent of American beef comes from Oklahoma, while the state produces 6.1 percent of American wheat, 4.2 percent of American pig products, and 2.2 percent of dairy products. The state had 83,500 farms in 2005, collectively producing $4.3 billion in animal products and under one billion dollars in crop output with more than $6.1 billion added to the state's gross domestic product. Poultry and swine are its second and third-largest agricultural industries. The state is connected to the nation's rail network via Amtrak's Heartland Flyer, its only regional passenger rail line. It currently stretches from Oklahoma City to Fort Worth, Texas, though lawmakers began seeking funding in early 2007 to connect the Heartland Flyer to Tulsa. Two seaports on rivers serve Oklahoma: the Port of Muskogee and the Tulsa Port of Catoosa. The only port handling international cargo in the state, the Tulsa Port of Catoosa is the most inland ocean-going port in the nation and ships over two million tons of cargo each year. Both ports are located on the McClellan-Kerr Arkansas River Navigation System, which connects barge traffic from Tulsa and Muskogee to the Mississippi River via the Verdigris and Arkansas rivers, contributing to one of the busiest waterways in the world. Oklahoma State University operates a system of campuses with a main location in Stillwater. Oklahoma is ranked in the bottom three states in the nation for retaining high school seniors, with a drop-out rate of 3.2 percent. Conversely, it is ranked 36th in the nation for the relative number of adults with high school diplomas, though at 85.2 percent, it had the highest rate among southern states as of 2004. The University of Oklahoma and Oklahoma State University are the largest public institutions of higher education in Oklahoma, both operating through one primary campus and satellite campuses throughout the state. The two colleges, along with the University of Tulsa, rank among the country's best in undergraduate business programs,  and the University of Oklahoma and University of Tulsa are in the top percentage of universities nationally for academic ratings. Six of the state's universities were placed in the Princeton Review's list of best 122 regional colleges in 2007, and three made the list of top colleges for best value. The state has 54 post-secondary technical institutions for training in specific fields of industry or trade. Sports programs from 11 Oklahoma colleges and universities compete within the NCAA, with four participating at the association’s highest level, Division I: University of Oklahoma, Oklahoma State University, University of Tulsa, and Oral Roberts University. The University of Oklahoma Sooners and Oklahoma State Cowboys are rated in the top college sports programs in the nation by Sports Illustrated magazine. Twelve of the state's smaller colleges or universities participate within the NAIA. The Boston Avenue Methodist Church in Tulsa serves as a National Historic Landmark. In the late 1800s some 26 Indian reservations were established in Oklahoma. Today there are 39 tribes and nations of American Indians with headquarters remaining. Descendants of the original 67 tribes inhabiting Indian Territory still reside there, including the Cherokee, Cheyenne, Arapaho, Chickasaw, Choctaw, Creek, Iowa, Kansa, Tonkawa, Kickapoo, Kiowa, Apache, Comanche, Modoc, Seminole, Osage, Oto, Ottawa, Sac and Fox, Delaware, Potawatomi, Pawnee, Peoria, Ponca, Quapaw, Seneca, Shawnee, Wichita, Wyandot and a number of subgroups. The state had the second highest number of Native Americans, estimated at 398,200 in 2004, as well as the second highest percentage among all states. For this reason, Oklahoma is known by many, unofficially, as "Indian Country." 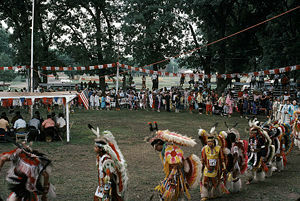 Native American cultural events like pow wows are common in Oklahoma. Oklahoma ranks 17th in per capita spending on the arts and contains more than 300 museums. The Sam Noble Oklahoma Museum of Natural History in Norman, one of the largest university-based art and history museums in the country, documents the natural history of the region. The collections of Thomas Gilcrease are housed in the Gilcrease Museum of Tulsa, which also holds the world's largest, most comprehensive collection of art and artifacts of the American West. Oklahoma City's National Cowboy and Western Heritage Museum documents the heritage of the American Western frontier. With remnants of the Holocaust and artifacts relevant to Judaism, the Sherwin Miller Museum of Jewish Art of Tulsa preserves the largest collection of Jewish art in the Southwest United States. In the state's largest cities, pockets of jazz culture from the 1920s still exist, and Native American, Mexican, and Asian enclaves produce music and art of their respective cultures. The Oklahoma Mozart Festival in Bartlesville is one of the largest classical music festivals in the southern United States, while Oklahoma City's Festival of the Arts has been named one of the top fine arts festivals in the nation. The Tulsa Ballet, one of the state's five major city ballet companies, is rated as one of the top ballet companies in the United States by the New York Times. Collegiate athletics are a popular draw in the state. The University of Oklahoma Sooners and the Oklahoma State University Cowboys average well over 60,000 fans attending their football games, and the University of Oklahoma's football program ranked 13th in attendance among American colleges in 2006, with an average of 84,561 people attending its home games. The two universities meet several times each year in rivalry matches known as the Bedlam Series, which are some of the greatest sporting draws to the state. ↑ Muriel Wright. June 1936. Chronicles of Oklahoma Oklahoma State University. Retrieved March 20, 2008. ↑ Derek Arndt. 2003. The Climate of Oklahoma Oklahoma Climatological Survey. Retrieved March 20, 2008. ↑ State of Oklahoma. 2003. Oklahoma in Brief Retrieved March 20, 2008. ↑ The Nature Conservatory. Tallgrass Prairie Preserve Retrieved March 20, 2008. ↑ Spiro Area Chamber of Commerce. The Historic Spiro Mounds Retrieved March 20, 2008. ↑ RootsWeb 1890 Indian Territory Map Retrieved March 20, 2008. ↑ Robert Hamilton. 2000. United States and Native American Relations Florida Gulf Coast University. Retrieved March 20, 2008. ↑ National Cowboy and Western Heritage Museum. Rushes to Statehood Retrieved March 20, 2008. ↑ CNN. 1996. Oklahoma City Tragedy Retrieved March 21, 2008. ↑ Lindsay G. Robertson, June 2001. Native Americans and the Law: Native Americans Under Current United States Law University of Oklahoma. Retrieved March 21, 2008. ↑ Oklahoma State Election Board. 2007. Registration by Party as of January 15, 2007 Retrieved March 21, 2008. ↑ Oklahoma Department of Commerce. An Overview Of Oklahoma's Target Industries Retrieved March 21, 2008. ↑ Mark C. Snead, 2006. Outlook Update – OKC GM Plant Closing Oklahoma State University. Retrieved March 21, 2008. ↑ Oklahoma Department of Commerce. November 19, 2003. Oklahoma at a Glance Retrieved March 21, 2008. ↑ United States Department of Energy. Oklahoma Energy Statistics Retrieved March 21, 2008. ↑ United States Department of Energy. Oklahoma Energy Overview Retrieved March 21, 2008. ↑ Legends of America. 2007. Route 66 - Facts and Trivia Retrieved March 21, 2008. ↑ Oklahoma Airport Operators Association. Airports of Oklahoma Retrieved March 21, 2008. ↑ Tulsa Chamber of Commerce. 2005. Live in Tulsa Retrieved March 21, 2008. ↑ Oklahoma State Department of Education. November 19, 2004. Superintendent Garrett announces Oklahoma #1 in Pre-Kindergarten Retrieved March 21, 2008. ↑ Oklahoma Education Information System. 2007. America's Best Colleges - 2007 Retrieved March 21, 2008. ↑ Sports Illustrated. October 7, 2002. America's Best Sports Colleges Retrieved March 21, 2008. ↑ Accessgenealogy Indian Tribal Records. Oklahoma Indian Reservations Retrieved December 18, 2007. ↑ Indianz.com. Native American population on the rise in U.S. Retrieved December 18, 2007. ↑ United States Census Bureau. 2005. Oklahoma - Selected Social Characteristics Retrieved March 21, 2008. ↑ Association of Religion Data Archives State Membership Report - Oklahoma Retrieved March 22, 2008. ↑ Oklahoma Department of Libraries. Oklahoma State Icons Retrieved March 22, 2008. Oklahoma Department of Tourism and Recreation. A Look at Oklahoma Retrieved March 20, 2008. Dale, Edward Everett and Morris L. Wardell. History of Oklahoma. New York: Prentice-Hall, 1948. questia.com.Retrieved March 24, 2008. Jones, Stephen. Oklahoma Politics in State and Nation (1907-62). Enid, OK: Haymaker Press, 1974. Philbrook Museum is one of the top 50 fine art museums in the United States. This page was last modified on 18 December 2018, at 15:36.